When you pick you the Samsung Galaxy Note Edge for the very first time you immediately feel the difference. The Curved Edge is just cool to touch, after having used a standard flat screens mobile for years the round smooth edge is truly unique to the feel and touch. While the specifications of the phone itself are incredible I want to focus on my usability of the edge. First and foremost Android users are going to have to retrain themselves. Instead of swiping to unlock the phone, you just click the home button and then via the edge quickly access the most important apps. I found myself over a couple of weeks customizing the edge menu to the point that it became my central launch point for the majority of important Apps I use on a regular basis. But I will be honest the first few days I kept unlocking the phone and going to the main menu but as I used the device more I found myself saving time bu launching apps from the edge with my thumb. I loaded Ingress, Mail, Camera, Browser. Google App Folder on my first edge. I then added several apps on the other. By default the Sprint folks that provided the review unit had it loaded with an initial set of apps that indicated to me that they had put some thought into it. 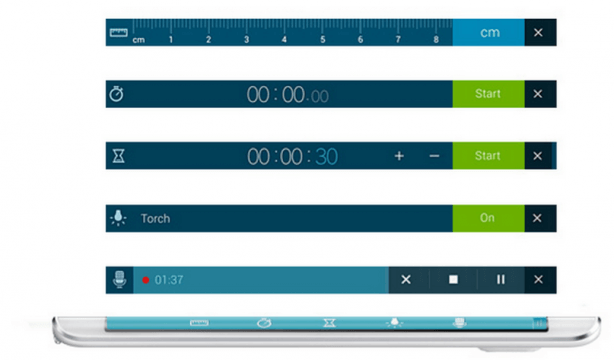 Not only can you scroll the edge side to side they also have a drop menu see below that is loaded with some fun tools, tape measure, voice recorder, flashlight activator, stop watch, countdown times and a ruler. 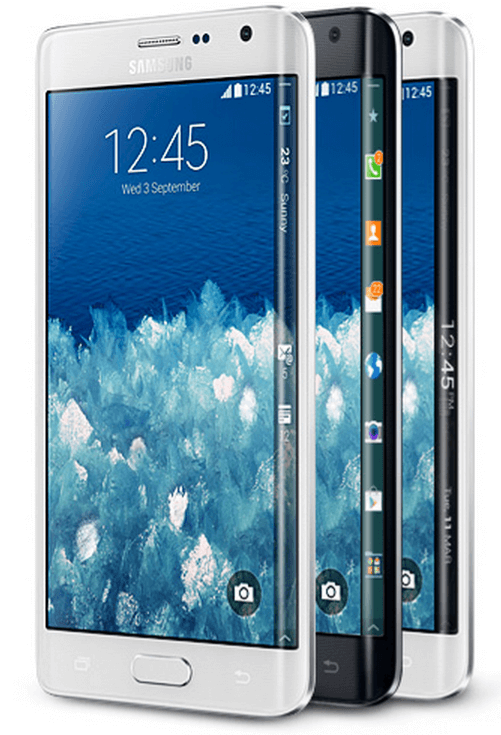 Overall Samsung has really outdone themselves.The 5.6 Quad + AMOLED Screen is simply breathtaking. The images taken with the camera where equally great with a Front 3.7MP and Rear 16MP camera. The Automated F-Stops allow excellent images in dark areas as well. The phone comes with a stylus that is totally unique. They call it S Pen, its like magic you do not even need to touch the screen with it to track. The screen tracked the stylus perfectly, and I could click on hyperlinks from the built in clicker in the stylus. The specifications of the device are detailed so be sure to review them on the Samsung site. Here in Hawaii and in Las Vegas Data Speeds where terrific while on the Sprint Network, and calls to and from the device were clear. The phone has good noise isolation as I used the phone as my primary device during CES and callers could hear me fine over the show floor noise. 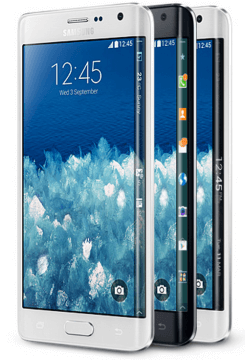 Overall the Sprint Samsung Galaxy Note Edge is a phone that will have everyone wanting to look at the curved screen technology. I encourage you to take a few extra minutes when you visit a retail store to play with this phone.. The edge is beyond useful in getting to apps and functions quick.